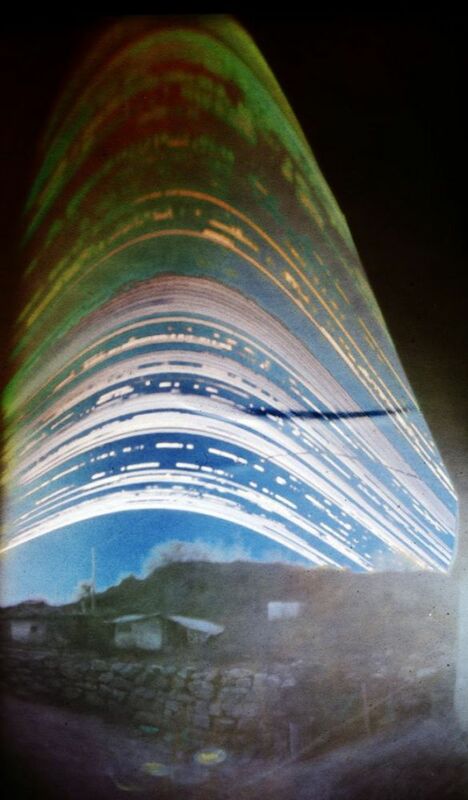 Our recent post about Kevin McCabe’s ‘cob citadel’ and what we might learn from it about ‘scaling up’ generated a lot of debate and discussion. 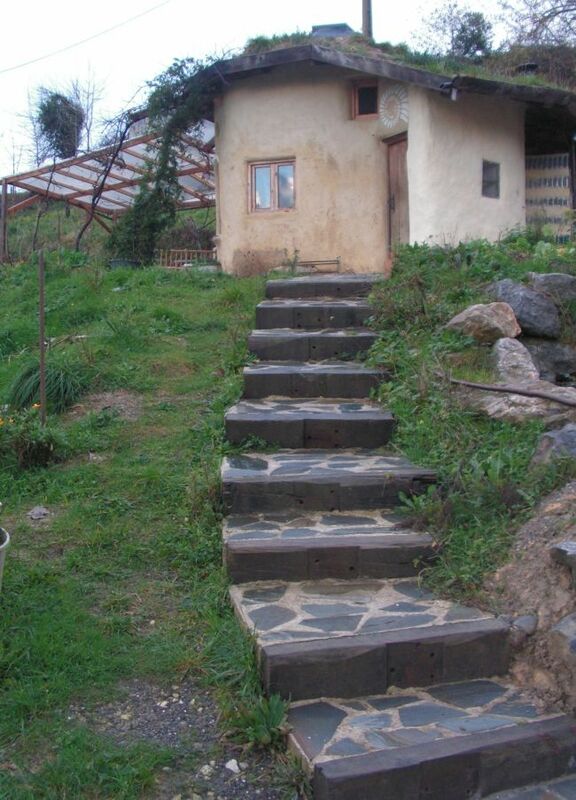 Robert Alcock, a cob self-builder living in Spain commented that “the really great thing about cob is that it is an inherently anti-mainstream material”. Intrigued, and wanting to hear more of his own story, I asked him if he might share his thoughts on how to scale up cob building while still maintaining its “anti-mainstream” properties. I started by asking him what he meant in his comment. “I suppose it depends on what we mean by “mainstream.” If we’re simply talking volume, then I could point out that somewhere between one-third and one-half of the world’s population lives in houses made of earth; it’s probably the most widely used building material on the planet. So, not much scaling up left to do, then! But even though earth building is widespread globally, most people reading this wouldn’t consider it “mainstream,” because like most local building traditions, it almost disappeared in industrialised countries during the 20th century, in favour of a building industry in which materials were transported long distances and assembled by specialists. Partly as a reaction against the conventional building industry—its high environmental, social and economic costs, and the buildings it turns out, which are globally homogeneous, ugly, boring and soulless—there has been a resurgence of building with natural materials, especially in the last 25 years. 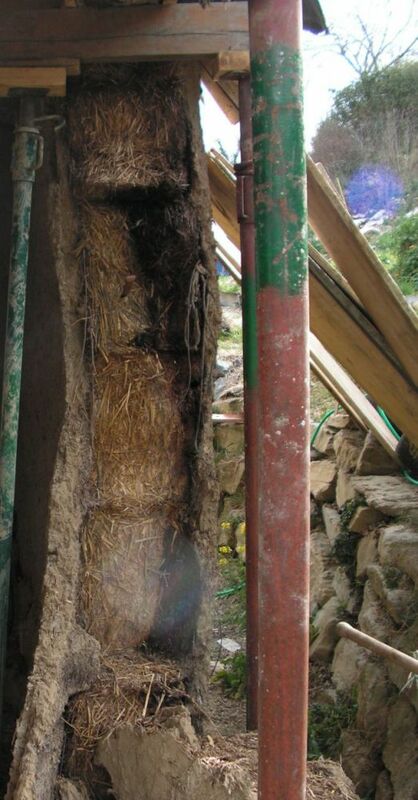 Of all the natural building techniques that are being rediscovered, though, cob is the one that has given rise to an underground self-build movement. The main reason is that cob is such an amazing material. It’s very simple—a mixture of clay, aggregate (sand), fibre (usually straw) and water—widely available and cheap; yet it’s structurally strong, extremely durable, adaptable, infinitely recyclable, breathable and non-toxic; and, to work with, sculptural, malleable, sensual and, in a word, just plain fun. Most cob projects around the world are really small—benches, ovens, sculptures, walls or at most small cabins—built by workshop groups, communities, families or individuals. 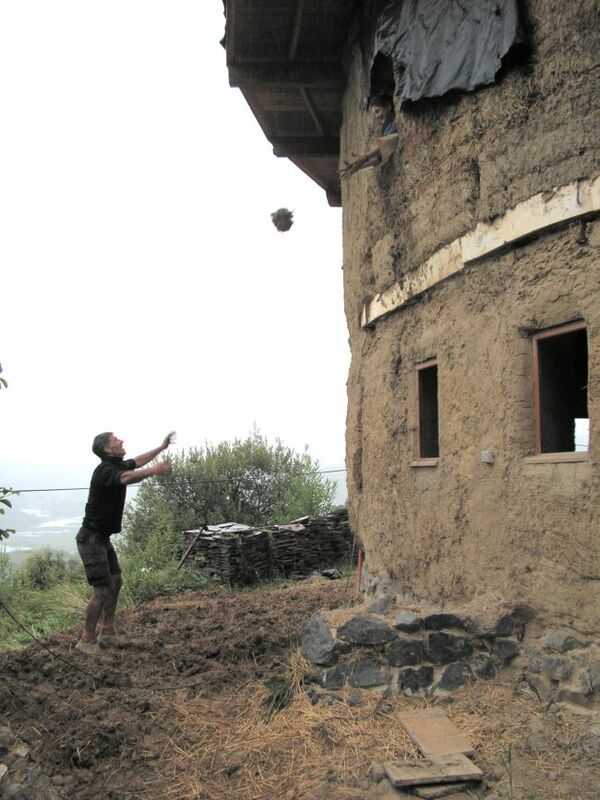 Because it’s such an easy and enjoyable material to use, building with cob is an incredibly empowering experience. It’s labour-intensive, sure, but it’s a form of labour that involves throwing balls of mud and kneading them into shape with your bare hands and feet, getting in close contact with earth, the mother material, and working in the fresh air with other people. It’s a healthy activity in every sense—the polar opposite of the conventional building industry, which is one of the most dangerous and unhealthy to work in. And, because of its sculptural qualities, cob structures tend to be quirky, individual, organic, beautiful. It’s almost impossible to build something boring or ugly with cob. And if you don’t like what you’ve built, you can always just knock it down, re-mix the cob and start again! Another factor in the resurgence of cob is that it’s potentially extremely cheap to build with. It lends itself to small scale construction and the use of recycled, local and natural materials. The first cob house I heard about was Cob Cottage Company’s “Heart House,” which is supposed to have been built for $500 in materials. We built our first cob house, Snail Cabin, for around €6000 in materials. In this sense, also, cob self-build is the polar opposite of the conventional housing market. 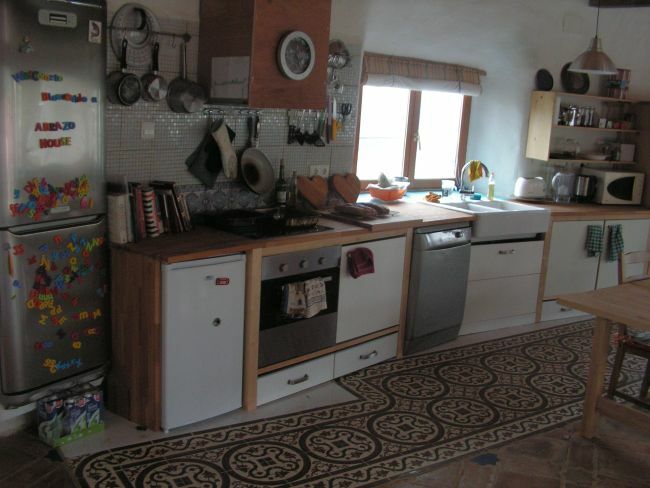 Of course, that doesn’t mean all cob houses are cheap—I was rather shocked to learn that Kevin McCabe’s own first cob house (or complex) was on the market for £1.1 million! How did you get into cob building in the first place? I studied ecology and then worked as a technical writer on the environmental impacts of buildings and cities—which is as close as I’ve come to being a building professional. I did have the dream of building my own house, though, nurtured by such books as “Walden” and “A Pattern Language”, which made me aware that the art of building could be a harmonious part of the art of living. I did up and lived on a canal boat for a while, in the English Midlands where I grew up. Also my dad is a scholar of vernacular timber-framed buildings, so I was always being dragged round old houses as a kid. In 2000 I moved to Bilbao, my partner Almudena’s home town. The region we live in is sometimes called Green Spain. It’s a spectacular area whose climate and landscape are rather like a marriage of Cornwall and Cascadia, with an ancient patchwork of cultures—stone age, Basque, Celtic, Roman, Visigoth…. I was researching for a thesis on rocky shore organisms, mainly algae and limpets, which meant visiting most of the beaches around the Bay of Biscay. Tough, I know. 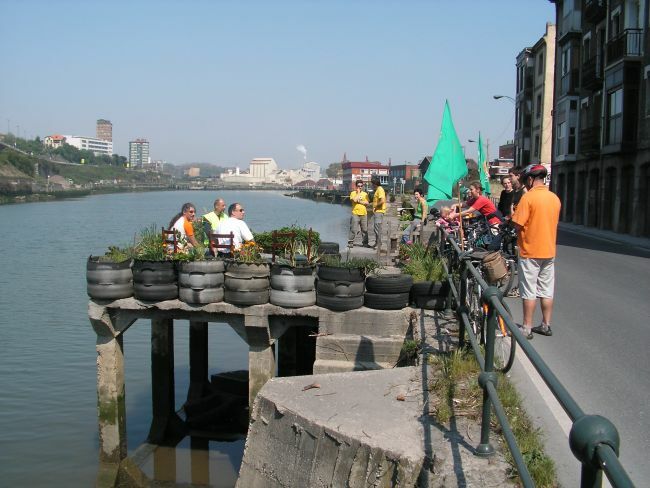 Around 2002, I realised that my vocation was ecological design. Most people probably have no idea what that is, though they might have heard of permaculture, which is a similar concept. For me, ecological design means designing anything—from furniture to gardens to money to cities—in the light of ecological awareness. It’s something that barely exists as a profession, and certainly didn’t in Bilbao in 2002. But I had found that I could earn decent money as a freelance translator and Bilbao was a pretty cheap place to live; to attain the same standard of living in Britain I would have had to get a “real” job, something I wasn’t particularly keen to do. So instead, I started doing work that I saw needed doing. 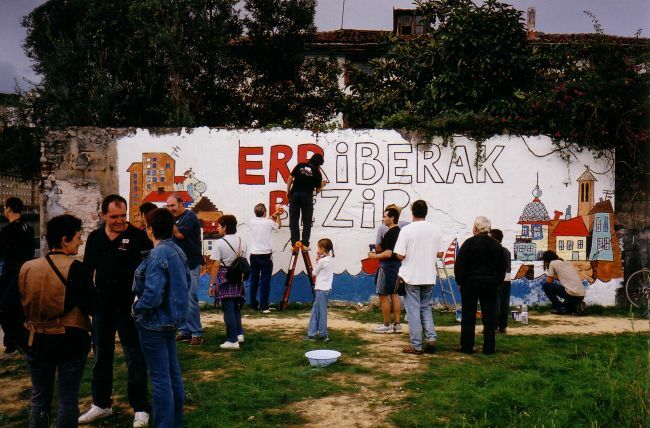 In 2003 Almudena and I started a Transition-like initiative—the Forum for a Sustainable Zorrozaurre—in the district where we were living, which was scheduled for urban renewal. Though the Forum was a success and the residents’ houses were saved, the experience taught me that sitting in meetings and organizing events leads to burnout, and is nowhere near as fulfilling as creating something with your own hands. Among other hands-on projects, I created a riverside container garden on a concrete platform, using free materials, which is still in use after almost ten years. Can you tell us about your own building project and what you feel you learned from it? 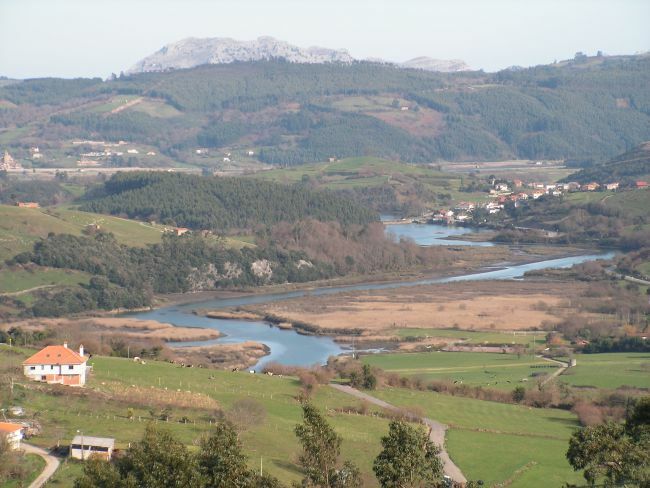 In 2005 we bought a plot of land in a small village an hour from Bilbao. Our idea was to create not just a house but an educational centre where people could come to learn about ecology, natural building and sustainable living. After reading The Hand Sculpted House, we decided to build with cob, for all the reasons already mentioned—plus, we had clay soil on site and the right climate. Closely linked to this was the decision to work with volunteers, who exchange their labour for food, accommodation and experience. Although we have organised one paid workshop and we don’t rule out running more in the future, we didn’t find that an effective way of building. We’ve now hosted more than 200 volunteers from all over the world, who have taught us a lot, as well as (I think) learning from us, the place and the work. We started off building a small cabin (Snail Cabin, right), as a learning project and also to have a place to stay. We ended up expanding the cabin several times—from about 15 m2 (150 sq ft) to about 50 m2 (500 sq ft)—which is a good strategy for self-builders, but unfortunately, we didn’t design the expansion very well. 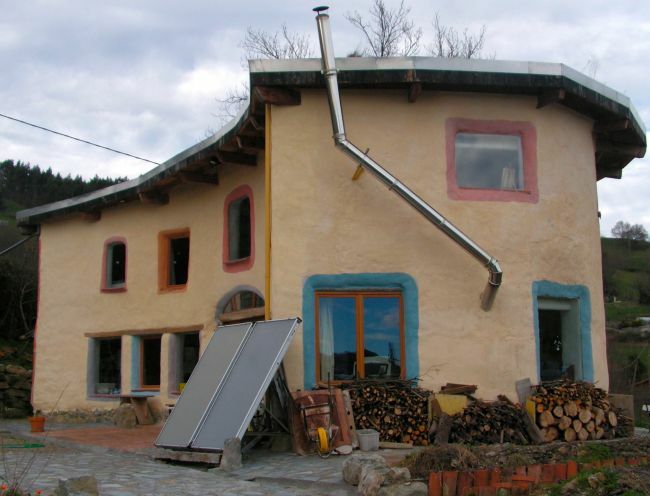 In summer 2008 we started on the main house (Abrazo House), a two-storey, 200 m2 (2000 sq ft) hybrid cob/straw bale house which took us four years to build; we moved in in September 2012, and spent last summer finishing the exterior. And after eight years, I’ve still got “cob stuck to my soul”. If this seems like a long time to spend building your house, well, it is—and then again it isn’t, if you think about how long people spend paying for their houses. The whole project to date, including the land, permits, plans, materials, paid work, and food for volunteers, has cost us about €160,000, which we paid for as we went along, with no mortgage. The average price of a house in Spain, for comparison, is €221,200 —for a 100 m2 (1000 sq ft) concrete box! Basically, the reason it took us this long comes down to the fact that we had to learn as we went along. We made loads of mistakes, but most of them cost us time rather than money. The main house was really a bit too big for a self-build project. Often I felt like the project was consuming my life—like I had spawned a cob monster. I felt like starting a group called “Autoconstructores Anónimos”—“Hi, I’m Robert and I’m a self-builder. I’ve dragged my family through the mud…” Now, of course, it’s great that we’ve got the extra space! Our most serious set-back was to do with straw bales, not cob. Originally the load-bearing wall of the house incorporated straw bales, for their added insulation value. But we suffered a very wet, windy winter and the bales started rotting (see right). 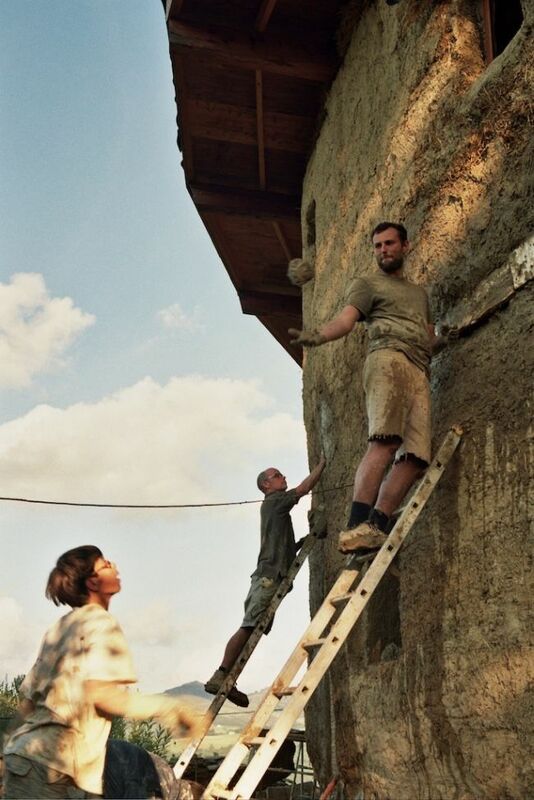 Eventually we had to tear out two-thirds of the lower storey wall, and support the upper storey on jacks for a year while we rebuilt the wall, using solid cob this time. It was a dark time. In hindsight, I would say that if your area is too wet for growing grain, as ours is, it’s definitely too wet to build with straw bales! But the resulting design—cob lower storey, bale-cob upper storey—is, I dare say, quite a nice compromise between durability, structural strength, and insulation value. But there were also a lot of things that are much more widely applicable—like how to work with nature instead of opposing it, how to organize work, get on with people, and the confidence and flexibility to try out ideas at a small scale and see how they work. I think the key difference between self-build and conventional building is that self-build is not just about building houses profitably—it’s also about building yourself, becoming a better, more resilient and more capable person. Self-build is about bringing your dreams to life, making them real. At the same time, many other things that may have been hidden—in your life, in your relationships—become real and tangible. At the moment I’m trying to write a book about the experience of self-build with cob, but it’s a lot less fun to write about it than it is to do it! If “scaling up” cob doesn’t mean building huge houses but means lots of small, self-built, locally-sourced materials, what are your thoughts on the obstacles to that, and how we might get there? Well, I definitely don’t think the way forward is to build pharaonic cob complexes! Nor, speaking personally, would I wish to become a professional cob builder who builds other people’s houses for money. For me, the best way for cob to scale up is the same way it has been spreading up to now—the mycelium model, in which a spore of knowledge lands somewhere and then spreads gradually out from that point. This means people who have experience guiding others up the steep slope of the learning curve, while allowing them the freedom, and the responsibility, to make, and to own, their mistakes. This “facilitated self-build” is something I’m involved in now. A friend and neighbour has started building his own cob house—a 45 m2 (450 sq ft), one-and-a-half-storey cottage, for which I’m giving design advice and practical help. 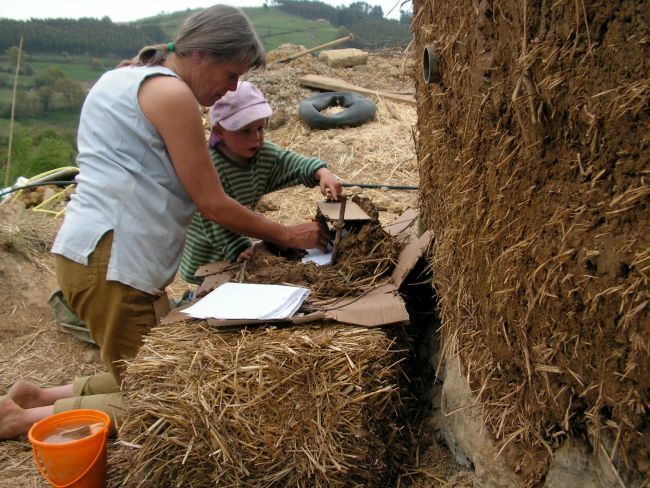 We also have a project to build two more cob houses in the small village where we live, and we’re looking for people, preferably families, to invest and get involved as self-builders, with a view to forming the nucleus of an eco-village. I would like to see cob moving away from extremely tiny, under-the-radar projects and toward scales which are more practical and economical. Sure, a tiny cabin is very cheap to build—but you can build a 50m2/500 sq ft cottage for only about twice the cost of a 15m2/150 sq ft cabin, and heat it for virtually the same cost. I think the major obstacles to the expansion of self-build with cob and other natural materials are not economic or practical, but cultural and political. Sure, there is a “skills gap”—in working with cob, as with almost every traditional skill—but these skills can be learnt or rediscovered. More fundamentally, I think, there is an “empowerment gap”. Most people who dream of building their own house will never be able to, because of the many, almost insurmountable obstacles: finding and buying land, obtaining permission, and having the confidence to begin the process. You could argue that shelter, which is a vital need for human beings, should also be a human right—within ecological limits, that is, provided you don’t make a negative, irreversible impact on the locality or the planet. Building your own ecological house is something that should be open to all, rather than being a status symbol for the wealthy, and the laws need to be changed accordingly. The housing market, as it currently exists, is the primary engine of poverty and inequality in most “wealthy” countries. Housing, as well as being a vital need, is an artificially limited good, so excess demand leads to rising prices and speculation. What it comes down to is that we are all playing a game of Monopoly, but one in which a few players started with almost all the money and the richest players get to make the rules. (Not many people seem to realise that Monopoly is meant as satire.) So nobody should be surprised to see the gap between rich and poor getting wider and wider. As a board game this would be rather predictable and pointless; in real life it’s tragic. And not much can be done about it unless we change the rules and play a different sort of game. History teaches us that human rights, once denied, can only be reclaimed through sustained campaigning, of the kind pioneered by the suffragettes or the Civil Rights movement—including (but not limited to) direct action and civil disobedience. 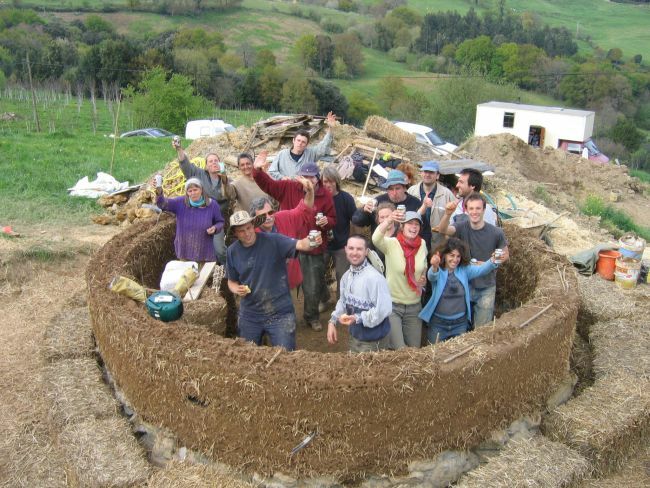 Recall the case of Tony Wrench’s roundhouse, which eventually led to the planning laws permitting ecovillages in Wales—though as I understand it, there are so many hoops to jump through that very few projects have taken advantage of this. 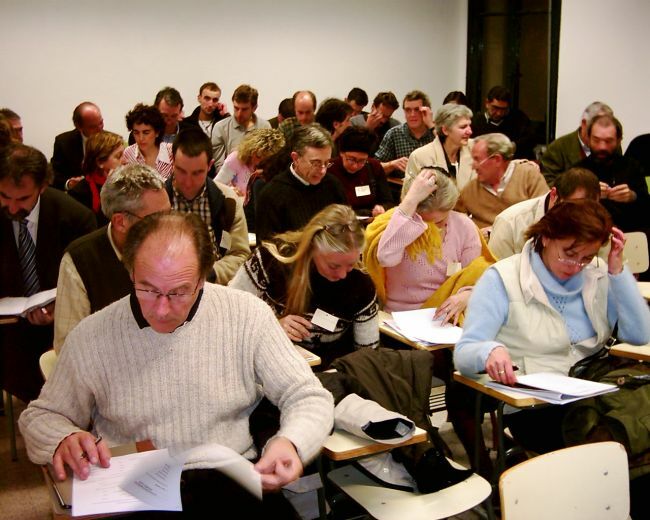 From your perspective, is there no role for professionalising and bringing more business acumen into cob building? Can you imagine developers building large scale cob developments? Well, yes, I can easily imagine it. Take the example of Cranbrook, the new town near Exeter mentioned by Kevin McCabe. Just suppose the Devon planners—instead of knuckling under to the developers’ demands for homogeneity—actually stood up to them and required that all 2,900 homes be built out of cob (and using passive solar design, I trust, which adds no extra capital cost, being mainly a question of size, shape and orientation of the house and the windows). You would be amazed how quickly the companies would get their skates on and learn to do it—it’s not rocket science! 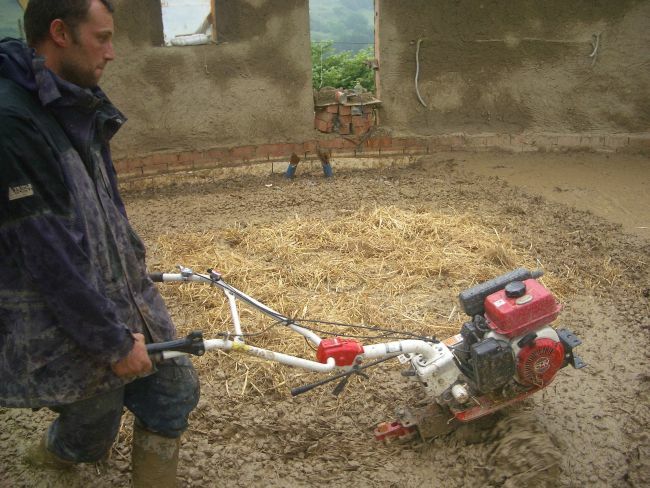 If there’s one thing Kevin’s project has proven, it’s that you can build huge volumes of cob quickly and cheaply. With those economies of scale, and the raw material right to hand, I suspect it would end up a bit cheaper than brick—whereas if only a few token houses were built with cob, it would naturally be more expensive. Also, I reckon people would be queuing up to live in the “cob new town”—think of all the free publicity! But this scenario, unfortunately, wouldn’t lead to the empowerment of people, nor would it deal with the issue of affordability—at least, not directly. However, with all that cob flying around, I’m sure some of its magic would rub off. You could make a case that a proportion of the houses should be designated as self-build projects. Or perhaps some people would choose to save money by finishing their houses off themselves, little by little and working together, and getting a more individual result—basically self-build except that the heavy work has been done for you. Construction waste from the developer-built houses could be recycled by the self-builders. A local cob culture would spring up (again). That, I think, could be a viable hybrid between mainstream construction and cob. The real question is, are people going to allow developers who are only interested in the “bottom line”, to dictate the pattern of development? I would never hire a builder who was only in it for the money—I’d hire one who showed pride in his work! I went to the Cranbrook website and followed the link to their sustainability policy —which leads to an error message on the Eon electricity company’s website. Something tells me there is not much due diligence going on here! There’s also a place for the opposite kind of hybrid—i.e. professionalism within self-build. Skills like roofing, plumbing and electrical work are just as necessary in cob as in any other form of building, and their specific application to cob could lead to specialist businesses developing. We hired a plumber and an electrician on our main house and we’ve not regretted it. 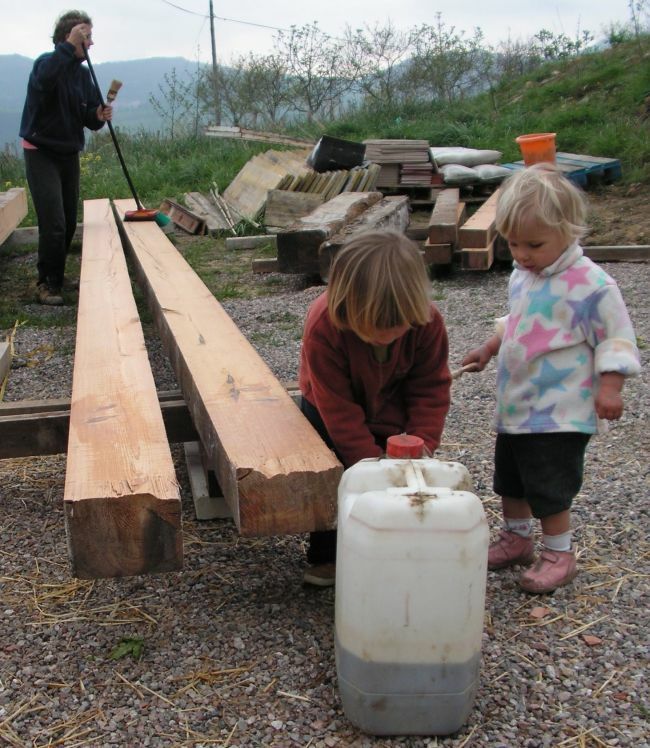 And perhaps most importantly, designing houses in ways that facilitate self-build (like the Segal method of timber building, but with other materials) is a skill that I hope will become much more widespread. 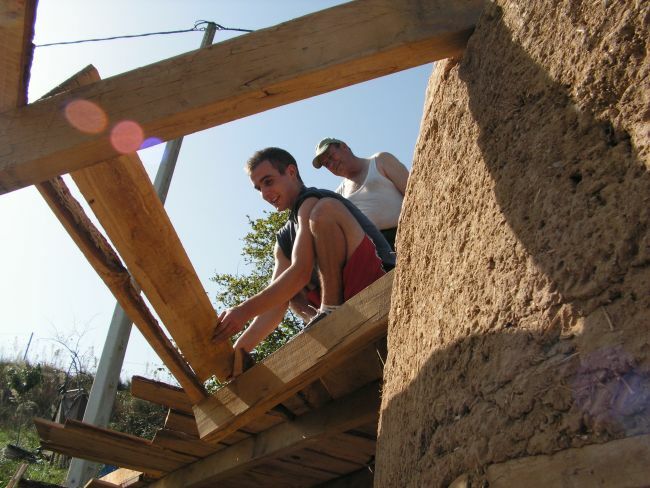 Part of the motivation in Kevin’s work is trying to push cob building to higher energy efficiency standards. In the UK from 2016 all new buildings will have to be built to Code 6, and PassivHaus ratings are growing in popularity too. Is your sense that cob should be striving to keep up with those, trying to adapt itself to that agenda, or does it offer a different route to achieving those objectives? Energy efficiency is certainly an important goal, but it’s not the be-all and end-all. You can’t let an arbitrary standard in one aspect of design, work to the detriment of other areas. 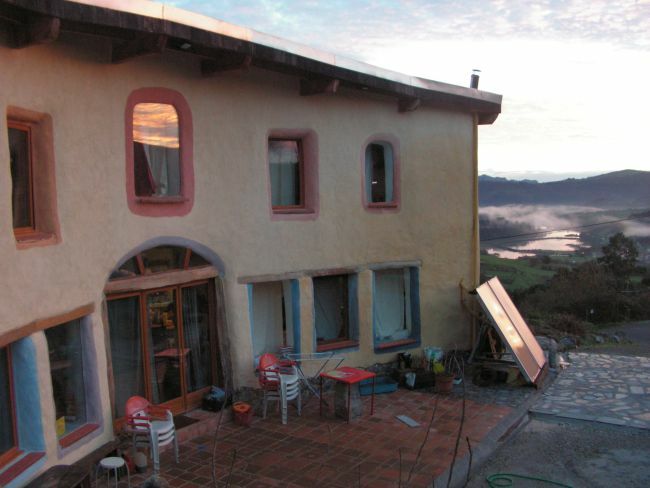 Our house isn’t built to PassivHaus standard, but it’s free and carbon-neutral to heat. Our average winter (December to March) temperatures here, at 43°N and 140m above sea level, are about 8°C—only a tad warmer than Devon, in other words. In the main house we burn about 1.6m3 (half a cord) of firewood each winter, which also heats our hot water when it’s cloudy and the solar panels don’t work. I cut most of next year’s firewood from our forest garden last week, with a borrowed chainsaw—the rest we will scavenge, pallets and so on. The trees we’ve planted on our 8000 m2 (2 acres) of land absorb far more carbon every year than we burn. 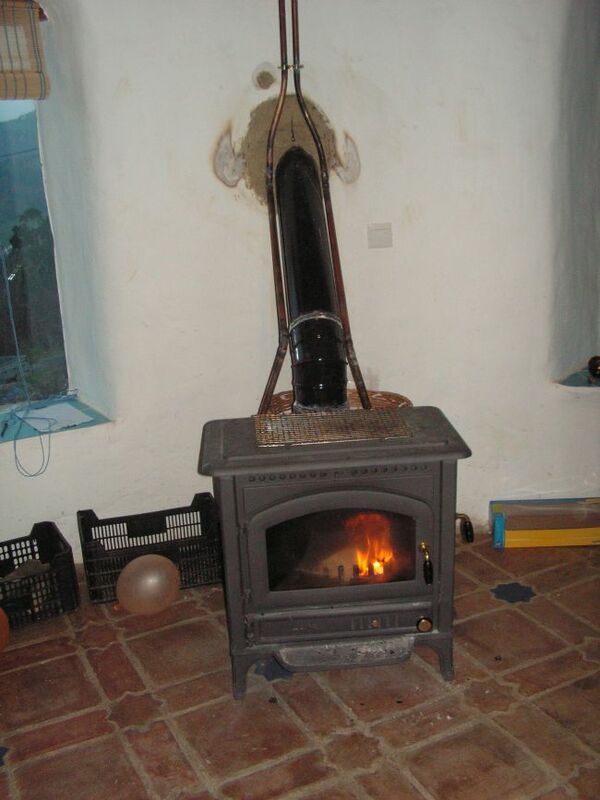 We have a wood stove instead of TV. I recognise that burning wood does contribute to air pollution—though not as much as TV contributes to mind pollution!—but there are ways to make it much cleaner, such as rocket stoves, which is something we are going to try out in my friend’s cottage when it’s finished. In any case, there are plenty of ways to improve energy efficiency short of cladding your house in polystyrene. Most of these are straightforward, proven, cheap techniques of passive solar design—like south-facing glazing, earth sheltering, and unheated buffer spaces (garage, porch, storage, workshop) to the north, east and west. I don’t know whether things like this are included in the building codes, but they certainly should be. Most architects, unfortunately, aren’t even taught to locate the path of the sun across the sky in winter and summer. You can also improve the insulation value of cob by including more fibre—we used wood shavings in the wall of our main house. What for you is the magic of cob? What does earthen architecture do that nothing else can? All natural materials—wood, stone, straw, earth, snow—have their own forms of magic, but I do think that cob is perhaps the most magical of all. Cob moves in mysterious ways and has the power to create a new culture of building—and of living. I suppose I’m biassed, because I had cob in my blood long before I was aware of it. My mum grew up in the Pacific Northwest—which would later become the birthplace of cob in North America—whereas my dad’s family are from Devon, where cob originated. In fact I was born in Exeter and used to spend holidays at my grandfather’s house in a small village nearby. It wasn’t until 2007, after I had built my own cob cabin, when I returned to the village to visit my grandfather’s grave, that I realised, to my amazement, that all the houses—except my grandfather’s—were made of cob. 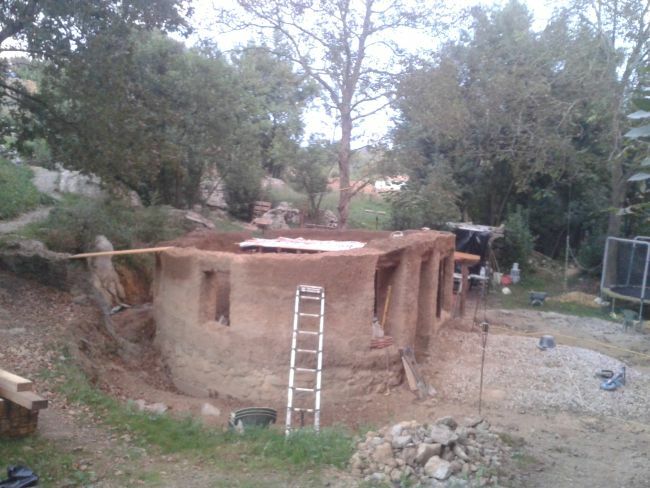 Meanwhile, my partner Almudena’s family came from Castille, another area where earth building (though not cob) is the rule; her dad used to build rammed earth houses with his dad. And I discovered that building with cob brought me closer both to my dad and to my father-in-law, with whom I’d previously struggled to find things in common. So natural building (in our case, with earth) can help connect us to our roots. But what it also does is connect us to the place where we choose to live—even if that is not where our ancestral roots lie. By building with materials from the site, we link our structures intimately with the place. And the act of working to create your house also makes you a part of the place, makes it a home—far more so than putting down a deposit on a new semi! It is especially in the process of building, I think, where the magic of cob lies. I can’t justify this scientifically, but I think that there is an energy in raw, unfired earth and that we tap into that energy when we work with cob—apart from the obvious benefits of working with non-toxic materials in the fresh air and in good company. If I spend the day working with bricks or cement, I end up exhausted and burned out—and most of the conventional builders I have met have work-related health problems and/or grumpy characters. If I spend the day working with wood, by the end I am tense and bruised, though pleasantly tired. If I work with cob, I finish up tired but relaxed and energised. And because it doesn’t stress you out, you’re much less likely to have serious accidents. The biggest problem with working in cob is that it’s very dirty—it just sticks to everything! Cob also encourages a playful attitude to building, and to life. Everything is malleable—even after it’s dried, it can always be wetted and reworked. In contact with cob, things—and people—cease to be what we think they are and are thus permitted to become what they really are. A shelving unit from a well-known Swedish megastore can become a ladder for getting up to the loft. An old pair of skis can become a shelf. A broken fridge can become a cool cabinet set into the north wall. If you’re building a concrete house and your plans turn out to be a mistake, tough luck. They’re “set in concrete”. With cob, you just change it. In fact we pretty much threw away the plans for the main house after we finished building the cabin, because we had learned so much by then that they were obsolete. Then we were blessed by the unexpected arrival of some enormous wooden beams from a demolition job—longleaf pine, an outstanding structural timber that’s no longer available commercially—and basically redesigned the house around the beams. 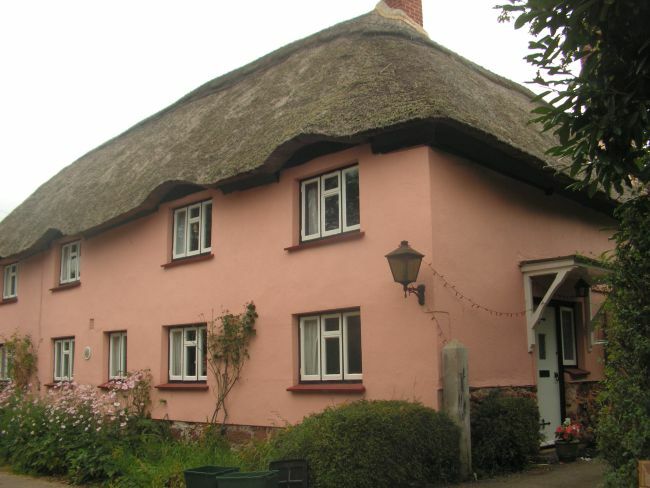 That’s the flexibility of self-build and especially of cob. And I have no doubt that that is the mindset we need for the 21st century, whether we’re working with cob or not. Some people think cob is the material of the past, but I’m convinced that it’s also the material of the future. If you were able to leap 20 years into the future into a world where cob had “scaled up” (however you choose to interpret that), what would it look like? Obviously, I would expect to see a lot more people building their own mortgage-free houses with cob and other natural materials, as an accepted and respected practice. Of course, this will mean that people are less dependent on the banks, the construction industry, and the money economy in general. That would be good news for people and the planet, but bad news for the money economy. Since the UK’s formal economy is now based on financial services, the bankers will have to find something else to do—they had better start volunteering on natural building projects sooner rather than later! walker, there is no path, you make the path by walking.